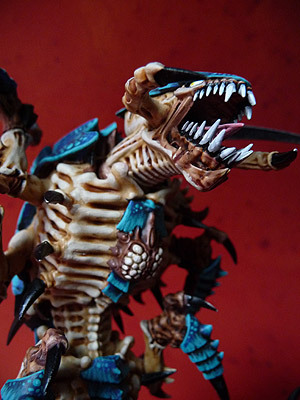 Confessions of a 40k addict: 'nids part 53 / Terrain is everything - Tyranid Quad Gun pt3. 'nids part 53 / Terrain is everything - Tyranid Quad Gun pt3. Talking of quad guns, here's where we are at. Tyranid armour plates have been sculpted in place. Unfortunately I didn't prep this to be what i had in my head, perhaps a sketch might have been in order. The aspect I'm unhappy about, but will have to accept, is that I didn't bulk out the base enough. I wanted a more bulbous squashed tomato profile, instead its a bit mushroom like. I also hadn't thought ahead regarding the fleshy top encased in the plates, it needed some texture so I was forced to take a drill bit to it to achieve something. It's the best of a bad job to be sure and I believe it'll get some praise but it's not 100% what I hoped for. You can tell how much I wanted to bulk it out by the empty space in front on the base. I also added the Trygon Prime tail as a node antenna, with some reasonably sculpted fleshy folds. I also added a slight spinal ride running up the back to the toxin sacs, which I hope don't look too 'stuck on'. The second shot shoes the spinal ridge better. If you actually look closely on the Tyranid Codex you will notice quite a few little green creepy crawlies pottering around on the crazy Tyranid bio-structures. By all accounts they're the adrenal sac bio-morphs. Almost all of the Tyranid weapons and upgrades revolve around symbiotic organisms that attach to the greater Tyranid creature. But we don't often see many of the little beggars mooching about on actual models as we see in the cover. I've always thought that was a bit sad as plenty of folk will have spare Adrenal Sacs. I've put them on a couple of figures but never been openly creative with their painting, so they don't stand out. The problem is I never truly decided how to paint them, the Trygon's is just painted bonewhite, the Tervigon is more yellow in place and the one on my Tyranid Prime is practically camouflaged. I like the addition of the tail. As for colors, it would seem that the bulk of the base should match the chitin of your army, but I don't see why the center can't be any color you want. Is that what you wanted to paint red? Actually the bits I was deliberating over painting red are the three grey things on the base crawling up the armored plates. The centre will be the liver colour but as the Mechrite Red bits on the tervigon are really making all the other colours pop then I may make it more red like you suggest. Glad you like the tail, it was a bit of a gamble, I was surprised how well I sculpted it in place. Another option I though of used MC scything talons between each Chitin Plate, like they were some form of support leg anchoring it in the ground. But why use a part that might be handy on something else ;) Waste not want not!